Did you ever want to be a hero? Have you ever dreamed of going on an epic quest to destroy monsters, defeat evil forces and fly on the back of a dragon? This interactive new self-help book puts you, the reader, in a fantasy world where every decision you make and every path you take will influence the outcome of your journey. When the seer Anka spirits you away to the world of Here, you find yourself proclaimed the Chosen One - the hero everyone is relying on to defeat the evil sorceress Mallena before she destroys everything. But you don't feel like a hero, do you? If you choose to accept this quest, you will have an opportunity to learn the skills that you need and put together a crew of loyal friends and companions to help you with your journey. The skills are based on acceptance and commitment therapy (ACT), which has been shown through research to help people overcome depression, anxiety, posttraumatic stress disorder (PTSD), chronic pain, addiction disorders and many other common problems. Your journey will be full of danger, loss and strange creatures, but it will also be full of excitement, adventure and fun, and will let you form life-long bonds of friendship, which no curses can break. This book is your call to adventure, an invitation to be the hero in your own story. 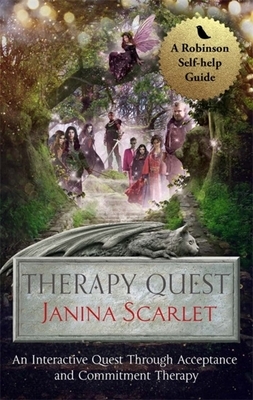 Dr. Janina Scarlet is a Licensed Clinical Psychologist at the Center for Stress and Anxiety Management and a scientist at Alliant International University. She is experienced in using ACT to treat anxiety, depression, and trauma. In addition, she is the author of Superhero Therapy and has contributed chapters to Posttraumatic Stress Disorder, Star Wars Psychology, Star Trek Psychology, The Walking Dead Psychology and Game of Thrones Psychology.